We’re continually honored by the work we do in partnership with amazing hospitals across the country, and this month, we’re featuring the inspiring work of the NICU team at Cone Health – Women’s Hospital in Greensboro, NC. We teamed up to be a part of their first ever Skin-to-Skin Challenge through a Buy One, Donate One program we offered with our Pocket. For every Pocket that the hospital purchased during their Challenge, we donated one, enabling every baby in their NICU to be held skin to skin in a NüRoo Pocket. The results of their Challenge were outstanding, truly demonstrating their dedication + commitment to raising awareness about the importance of skin-to-skin contact for the development of preemies. While attending the Gravens Conference, Trisha Taylor, RN, BSN, learned about the importance of appropriate developmental care for NICU infants. 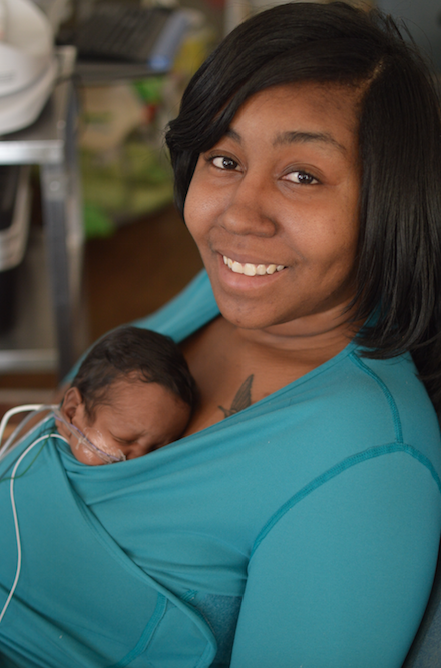 Along with colleagues Susan Jones and Juanyetta Beasley, Taylor organized the NICU’s inaugural skin-to- skin effort. “I thought this would be a great way to bring a part of appropriate developmental care to the forefront of our care at Women’s Hospital. Part of this kind of care is skin-to-skin contact”, said Taylor. To kick off the event, Sue Pedaline, RN, VP of Nursing and Patient Care for Women’s Hospital, dressed up as “Kanga-Sue” and visited the NICU to pass out chocolate hugs and kisses. The challenge, which encouraged friendly competition among shifts for the most skin-to-skin hours, inspired both providers and parents to spend skin-to-skin time with premature infants. During the event, which was conducted in partnership with the Canadian Premature Babies Foundation and Family Support Network (FSN) of Central North Carolina, 19 NICU babies received a total of 199 hours and 45 minutes of skin-to-skin care, and 59 parents and staff members participated. Also, one set of parents provided over 66 hours of skin-to-skin care for their son!